Now you can control your GM car from anywhere, as long as you have a mobile phone. OnStar service run by General Motors, will let you unlock, activate horn, check fuel and oil levels, tyre pressure or even start the engine right from your mobile phone. Imagine the convenience of having your car calling you out by honking and flashing lights for you in a crowded parking lot. Of course, it requires that the car is one of those GM cars, which come with an embedded mobile phone. Intended initially to be used to automatically detect accidents, this technology now empowers you to do a lot more. All you need to do is to download and install the app on your iPhone or Android device (currently only these two platforms are supported) and start using it. 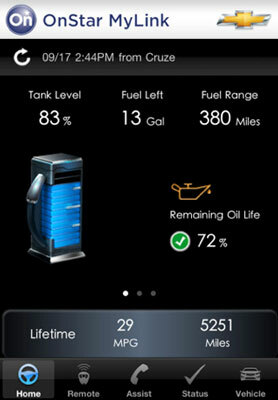 The OnStar service can still not be used with all the models of this year, but future models will support it. You can check out more about it or watch a demonstration video here. While the technology is currently confined to General Motors, we will surely see it coming from more manufacturers in the future, now that GM has set the ball rolling. Currently, these cars are available only in the US. On a side-note, an OnStar commercial shows that a stolen SUV is remotely disabled and returned to the owner without any hassle. But researchers at University of California, San Diego say that the same can be achieved by a hacker who can gain control of the car. The catch is that the hacker first need to be able to connect his/her laptop to the diagnostic port, which is not that easy. Would you like to control your car from anywhere?